All models are configured with a Wide Field 10x eyepiece, quadruple nosepiece with DIN Semi-Plan Objectives, mechanical stage and sturdy stand with extended base for enhanced stability and comfort. There are a variety of options and accessories available including binocular & trinocular bodies, phase contrast, darkfield and polarizing. 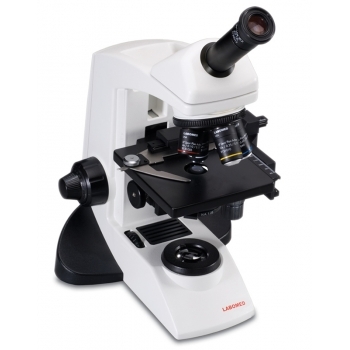 This microscope is recommended for high school and university use and offers outstanding value with features found in microscopes costing hundreds more. It comes with a manufactures five year warranty and Free One Year Extended Warranty for a total of six years. Click the button below to add the Labomed CXL Monocular Microscope to your wish list.